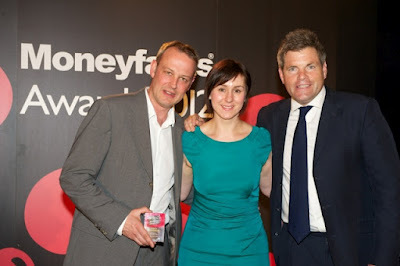 One of my clients, MoneyVista, was recently highly commended in the innovation category at the MoneyFacts Awards 2012, coming in just behind the winner, Governor Money. I am very proud to be associated with this success. Here is a picture of Martin Peterlechner (Marketing Director) on the left, and Karen Savva (Head of Customer Services) collecting the award.